Additional Info: Dan Wions, French Horn and Piano, former faculty at the Westminster Conservatory of Westminster Choir College, Princeton, NJ. Faculty at Summertrios chamber music festival. Extensive performance experience; orchestral, opera, concert band, chamber music, solo repertoire, pop, show tunes, and jazz. Performed under James Levine, Zubin Mehta, Michael Tilson Thomas, Manfred Honeck, Sir Andrew Davis, Charles Dutoit, Christoph Eschenbach, Kurt Masur, Lorin Maazel, Michael Stern, and Eri Klas, among others. Toured with various artists and ensembles, including Dave Brubeck, Aretha Franklin, Patti LaBelle, John Legend, Gloria Estefan and the Miami Sound Machine, Carlos Santana, Frank Sinatra Jr., Mannheim Steamroller, Patti Lupone, Anne Murray, Leann Rhimes, Ronan Tynan, Clay Aiken, The Irish Tenors, Josh Groban, The Philharmonic Orchestra of the Americas. Soloist with the National Concert Party (Chamber Orchestra of America) at the Kennedy Center, the Massapequa Philharmonic in NY, and the Bucks County Choral Society. A performing member of orchestras in AR, CT, DE, FL, GA, IN, KY, NJ, NY, PA, and Washington DC. Recent achievements and honors include winning Principal Horn of the Pennsylvania Ballet, being appointed as Hornist of the Brass Roots Trio, a finalist in the New York Philharmonic’s most recent Assistant Principal Horn audition, appointed as Principal horn of the Chamber Orchestra of New York and co-Principal horn of the Philharmonic Orchestra of the Americas, being chosen three times for the prestigious Verbier Festival Orchestra, being selected to play for the Dalai Lama in Bloomington, IN. Teachers include Michelle Baker, Myron Bloom, Scott Brubaker, Tony Cecere, Peter Gordon, Michael Hatfield, Rick Seraphinoff, and Chris Wilhjelm. 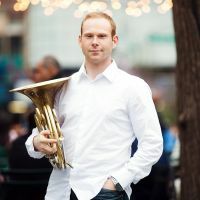 Dan holds a BM in Horn Performance, with outside studies in piano and composition, from Indiana University. In addition to Verbier, Dan has been a participant at the FAME festival and the National Orchestral Institute. Dan is also the CEO and founder of Live Music Consulting LLC (www.livemusicconsulting.com). He presently resides in Hillsborough, NJ, working as an active soloist, chamber musician, clinician, and freelance artist, mainly in the NJ, NY, PA, and DC areas, and contracting nationally.